CX Solutions :: How Good is Your Voice of the Customer Program? 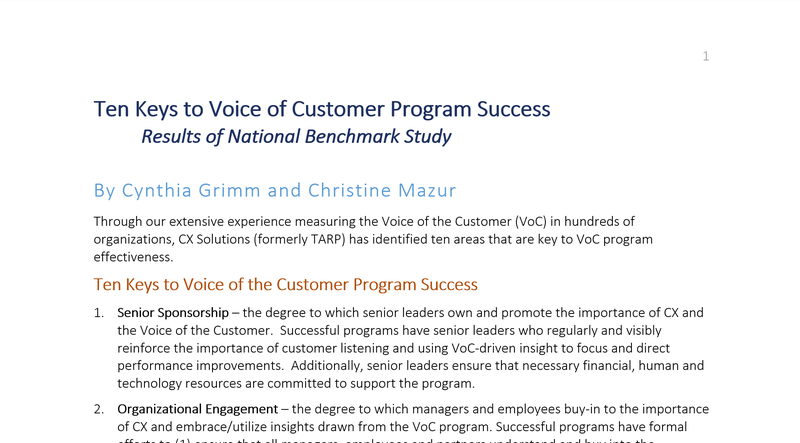 Throughout a series of blog posts, my colleagues at CX Solutions and I have been sharing findings from our recent Voice of the Customer (VoC) Practices and Effectiveness Study. Early in the series, we discussed ten keys to VoC program effectiveness. We went on to describe how, in our online survey of 289 organizations, managers were asked to assess the degree to which specific processes/practices in each of the ten areas have been fully implemented. Based on their responses, an implementation effectiveness score was calculated for each of the ten areas. This score ranges from 0 to 100%, depending on the degree to which all of the processes/practices in a given area have been fully implemented. In this post, we share more results – this time focusing on how perceptions of VoC program effectiveness vary depending on whose opinion you ask. The individual was a recipient and user of VoC-based information and insights. 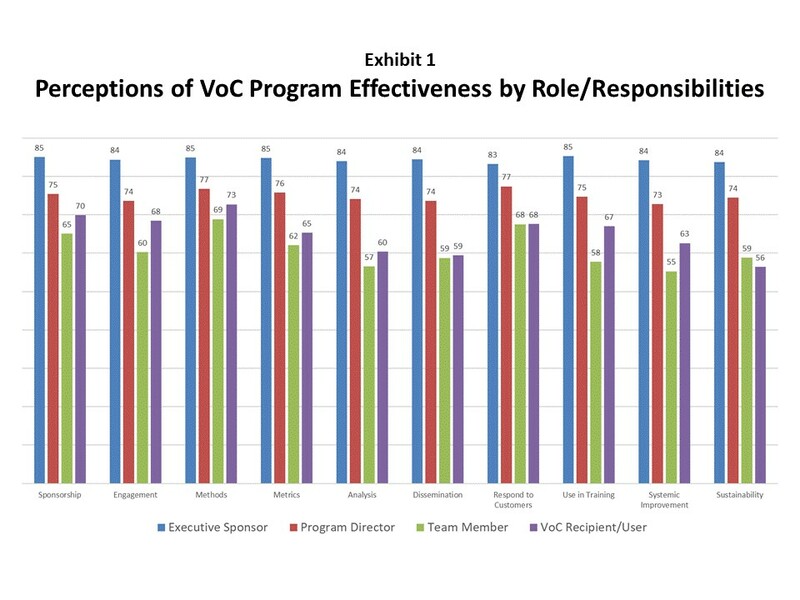 Results, shown in Exhibit 1, reveal that in all ten key areas of VoC Program Effectiveness, executive sponsors give the most favorable evaluations of any of the four groups. Program directors or team leaders consistently give the next most favorable evaluations, followed by VoC team members and VoC recipients and users. The differences between the scores of executive sponsors and all other groups are statistically significant (95% confidence level). In addition, and for the most part, differences between the scores given by program directors and team leaders also are significantly higher than VoC team members or VoC recipients and users. The latter two groups do not differ significantly from one another, and both consistently give the least favorable ratings of VoC program effectiveness. What are we to make of this? Why the discrepancies between more senior and less senior-level managers and employees? VoC program team members – the individuals who manage the program on a day-to-day basis – have the greatest working knowledge of what is good (and not so good) about that program. They are likely to factor their knowledge and understanding of “what’s missing” into program assessments. Ditto for VoC recipients – managers and employees who are expected to take action based on insights drawn from the Voice of the Customer. The data and insights they receive often lack detail and granularity needed to be actionable, even when these managers and employees have accountability for such action. We would expect knowledge and understanding of such deficiencies to work their way into VoC program assessments as well. In many organizations, upward communication of program problems and deficiencies doesn’t always make its way to the top of the organization. If these don’t have to be shared with senior executives, they often aren’t. If problems can be solved – or at least patches applied by program team members – they often are. Lacking knowledge and understanding of VoC program deficiencies and problems, senior executives might be apt to give more favorable program assessments than are warranted. On the flip side, senior executives and program directors may have access to other top-level executives and their perceptions of program effectiveness that team members and/or VoC recipients do not. From the perspectives of those in the “top of the house,” the program might be doing quite well at meeting its goals and objectives. If so, this would likely show up in program assessments of senior executives and sponsors. Regardless of which of the above potential explanations may be in play, all point to the need for effective vertical (i.e., upward and downward) communication regarding VoC program effectiveness. Front-line employees and managers, along with VoC users, probably have the greatest awareness and understanding of where there are gaps or opportunities to improve an organization’s VoC program. Senior sponsors and program directors probably have the greatest chance of making resources available to fill those gaps and pursue improvement opportunities. If your organization conducts periodic internal assessments of your VoC program, be sure to get perspectives of managers and employees having different program roles and responsibilities. 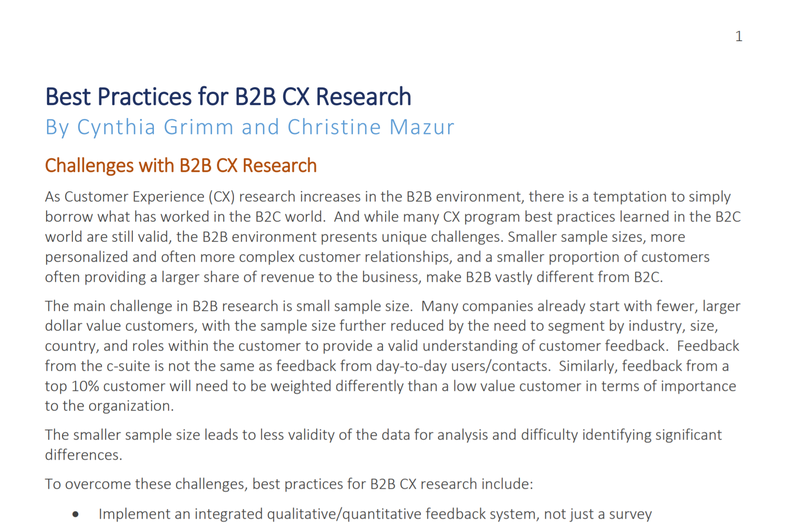 Compare those perspectives and use results to make your VoC program better.